One Wilderness Permit is all it takes to hike the entire trail, including the summit of Mount Whitney. For many, the most stressful part of planning a John Muir Trail thru-hike is obtaining the Wilderness Permit. There are good reasons for that. If you are going to leave from Happy Isles there are only thirty quotas per day, and with a short hiking season and lots of interest over the past several years, demand is high. Once Reese Witherspoon hits the screens this winter with her take on the Pacific Crest Trail, it’s only going to get worse. There are a few strategies you can use, however, to tilt the odds a little better in your favor. 2. Be flexible as to dates. If you can manage a three- or four-day window in order to make consecutive requests, your chances are (wait, wait) three or four times as great! This seems pretty obvious, but here’s the thing: you may not know if you got your reservation for a couple of days. If you wait to find out you didn’t, you may have wasted a couple of days. Keep submitting daily until you know you do have the reservation you are looking for, or until your window of opportunity closes. As you are planning next year’s trip, use one, two, or all of the strategies above, and good luck. If you strike out, don’t despair—you can always get a walk-up permit! Great advice Ray! My Son and I have been section hiking the JMT and we have had to pick alternate trailheads twice – however, it really doesn’t matter – once you’re on the JMT, where you started fades in importance and the fact that you’re in such a great place is all that matters! Happy Trails!!! Thanks for the comment, Steve, and you so right. Any walk in the Sierra Nevada is time well spent. Good blog post again, Ray. I have focused on item #3 myself and provide all the known, reasonable examples, of alternate trailheads and document ten all together. Latest write-up is here (I worked with Allison on updating the list). Terrific rundown, Roleigh. Thanks for sharing the link! After dealing with the attitude of Yosemite rangers too many times (vs. Sequoia/Kings and National Forest staff), I’m sticking to getting permits from outside YOSE. That Virginia Lakes option is particularly appealing. My experiences have generally been positive, although I’ve heard more than my share of troubling stories. There are darned few advantages of being old, but one seems to be that people tend to cut you some slack. Thanks for the comment, Arla. Thanks for the tips Ray. My wife and I will be applying for late July. As I understand, any of the permit options above will get you to the summit of whitney and out at the portal, correct? Cheers! That’s correct, Ryan, and one of the great benefits of starting in Yosemite…you don’t have to deal with the Whitney summit & portal permitting hassles. Thanks for the question! Good question. If you fax a request in on Monday, after 5 p.m., and you still have no idea 24 hours later if you did or did not get the reservation, I see no reason you can’t send in another request. You should definitely use the 1/2/3 choice blocks, but remember that you can’t use those to get a permit ahead of the 168 days. If you are making the request on the first day possible, those choices should be for different trailheads, not different dates. Thanks for the post. Been giving this a lot of thought lately, as I have a very narrow window of availability and am juggling my professional and family responsibilities (as I’m sure many do). I have a few questions that I’m hoping you can help with. My question is, if my preference is to start on a Saturday, but works backwards from there, say: 1st. Sat, 2nd. Fri, 3rd. Thurs, etc. Does it hurt my chances for getting a Saturday start if I apply for earlier days? If I’m granted on Wed (my last preference), will it preclude me from getting Saturday (my first)? And if I am able to get multiple days, can I take the one I like and forfeit the others such that someone else can take them? Also, assuming they remove me from consideration once I’m granted, say I’m traveling with a small group, is it bad etiquette to spread the applications over multiple days under multiple names and take the one we like and forfeit the rest? Great questions, Dave. Please keep in mind that what I suggest in regards to what is considered legal-but-not-appropriate is just an opinion. Plenty of folks take the attitude that the NPS set up this system, and people should be able to game it anyway they need to get what they want. Candidly, I’m not too far from that position myself. For example, I have no problem with people using alternate trailheads to reach all or part of the John Muir Trail, as long as they follow the rules on where they may and may not camp, etc. Also remember that whatever I tell you may be “right”, technically, and even “right” in the opinion of 8 out of 10 Rangers you talk to, but “not right” to the other two. I can relate several instances when Ranger 1 told me something that Ranger 2 told wasn’t true. Ultimately, the rules are what the enforcing Ranger says they are. Here are my thoughts: while I have no problem with someone requesting a reservation on Monday, and the doing it again on Tuesday (if they have either been denied or if they haven’t heard one way or another), I’m a little less enthusiastic about doing the reverse: requesting a permit on Monday, and then canceling it if you succeed on Tuesday, then canceling it if you succeed on Wednesday, etc. I know of no RULE that prohibits that approach, but (at least to me) that seems to be disrupting the process both for the Wilderness Center and for fellow hikers who are trying to get a permit. I have less of a problem with the same group of three requesting three wilderness permits (all for three) simply because I’m convinced that it is done so routinely that you are just artificially disadvantaging yourself. 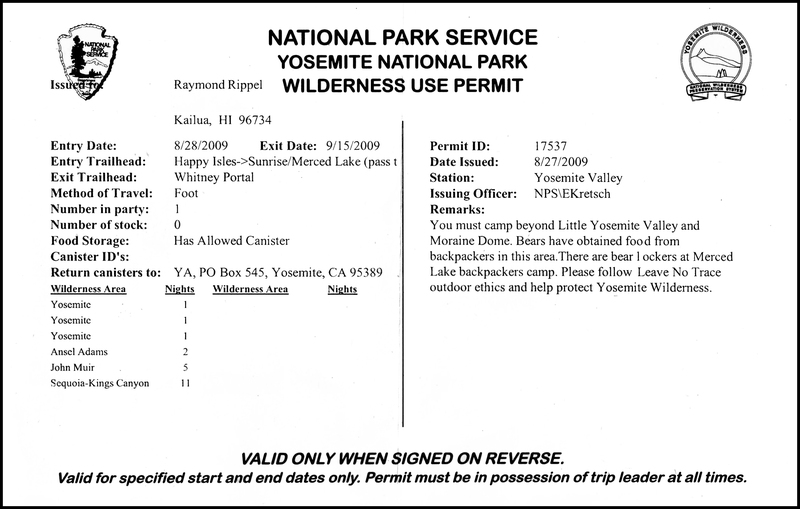 Securing permits is one of the most frustrating parts of a JMT hike, particularly if you are hiking in a group. Just remember, if all else fails, you can always stand in line the night before, and with more folks you can take shifts.